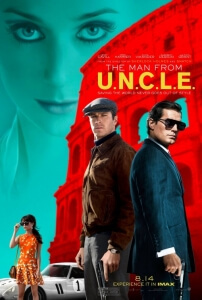 It’s been in development for years, with names like George Clooney and Tom Cruise thrown about at various points, but The Man From U.N.C.L.E, based on the Cold War-era TV show of the same name, is finally among us. Is it worth the wait? That depends on your taste for 60s-era spy flicks and their slick, suave nature – not just the Connery Bond films, but also Our Man Flint or The Spy Who Came In From The Cold among others. If you’re craving a return to that old-fashioned style, complete with dazzling dresses and charming men in suits that would make Don Draper jealous, then this should certainly satisfy your tastes; and even if you’re not into them, it’s still a mild but entertaining ride. Guy Ritchie directs, from a script co-written by him and producer Lionel Wigram, the tale of American CIA agent Napoleon Solo (Henry Cavill) and KGB operative Illya Kuryakin (Armie Hammer) being paired up on a mission, alongside Alicia Vikander’s daughter of a missing German scientist Gaby Teller, to stop a rogue criminal organisation, led by Elizabeth Debicki’s mastermind Victoria Vinciguerra, from making their own line of nuclear weapons. That’s pretty much it in terms of actual story; it’s very standard for a spy movie, and though there are a few twists and turns along the way it may shock some people that, in a time where more spy movies like Mission: Impossible – Rogue Nation and SPECTRE are making more effort to make their plots more complex, The Man From U.N.C.L.E is very simplistic with its own. You’re basically watching a spy movie right out of the 1960s – and given the movie’s overall feel, it feels completely intentional. It was a wise move on Ritchie’s part to keep the show’s Cold War setting for the film, instead of revamping it for modern political agendas which would have been a very misguided choice, especially nowadays (would YOU want to see an American secret service agent teaming up with al-Qaeda or a North Korean spy on a light-hearted romp across the globe? Yeah, we didn’t think so). It not only creates more of a dynamic between the opposing sides of international relations at the time, and since Cavill and Hammer have strong chemistry with each other you can consider that something of a success, but it also lends itself many opportunities to do everything in such wondrous style. Everything from the costume design to the cinematography to Daniel Pemberton’s playful musical score has its foot firmly stuck in this time period, and they are as glamorous as they are dangerously attractive. The one thing we’d say against it is that Ritchie doesn’t entirely take advantage of this style; if you’re going to replicate a 60s spy movie, then go all the way by mocking up the footage to look like a 60s projector reel or something, but that’s mere nit-picking. Like his previous two dabbles into Sherlock Holmes, Ritchie is also able to blend action and zany humour into a high-concept movie, and succeeds enough so that the audience is left relatively satisfied. A boat chase sequence is suddenly pushed into the background when a character decides to relax in a vehicle with Italian music playing on the radio and indulging himself in a food basket right beside him, just as boats crash into each other and explode elsewhere in the shot; another is reminiscent of The Green Mile, but it’s so darkly funny that to say anything more would be to ruin the surprise. Nonetheless, they are fun action sequences and certainly keep your attention thanks to the charismatic turns by its cast – Cavill in particular is entertaining to watch with his cool and collected mannerisms, like if Archer actually had a designated time period – and sense of un-cynical fun. The Man From U.N.C.L.E is hardly ground-breaking spy material, but its rooting in 60s-era styles and attitudes, as well as charismatic performances from its cast and entertaining action scenes by director Guy Ritchie, make it a worthwhile and harmless slice of cinematic fun.